Large and noisy charging solutions ruins first impressions and may affect your bottom line. Keep your vehicles fully charged and your showroom looking good with the new ShowroomCharger. 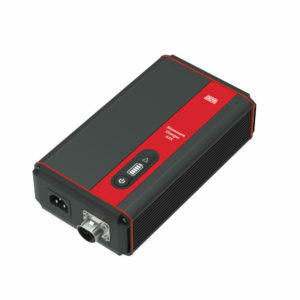 The ShowroomCharger is based on modern switch-mode technology and galvanic isolation. It is has a 95% efficiency and uses a 7-step charging cycle that optimizes the performance and durability of the batteries in your vehicles. The software can easily be upgraded via a separate USB port. The ShowroomCharger can easily be placed under the car, out of view for potential customers. The clamp cable can be detached and passed through the engine compartment. The ShowroomCharger has no fan and makes no noise. Rubber feet and corners are available to protect your vehicles and the showroom floor. The ShowroomCharger has only one button and a user-friendly display for monitoring the battery status. A compact size and a black anodized aluminium finish provides a pleasing exterior that fits right in with any modern showroom. All DEFA chargers are spark-proof and fully secured against reverse polarity and short circuiting.